This year’s Department of Kansas Mid-Winter Forum was held February 2, 3, and 4, 2018 at Pearce-Keller Post 17 in Manhattan, Kansas. Pictured are: Commander Abe Revira and Post Adjutant Jim Simpson with Leading Candidate for National Commander Brett Reistad from the Department of Virginia. Leading candidate for National Commander Brett Reistad has chosen “Celebrating Our Legacy” as his theme as the American Legion celebrates it’s centennial. The 100th American Legion National Convention in 2018 kicks off a 15-month commemoration to honor the organization’s first century of service and propel it into the second. Minneapolis, home of the 1st American Legion National Convention in 1919 will serve as host city of the 100th National Convention from Aug. 24-30, 2018. Centennial events and activities will be conducted at the national, department and post levels through the 101st National Convention in Indianapolis from Aug. 23-29, 2019, and will culminate on Veterans Day 2019. For additional information, see: http://centennial.legion.org/. Deputy Director Wayne Bollig, of Veterans Services Kansas City Veterans Administration spoke of the need for additional Veteran’s Homes. 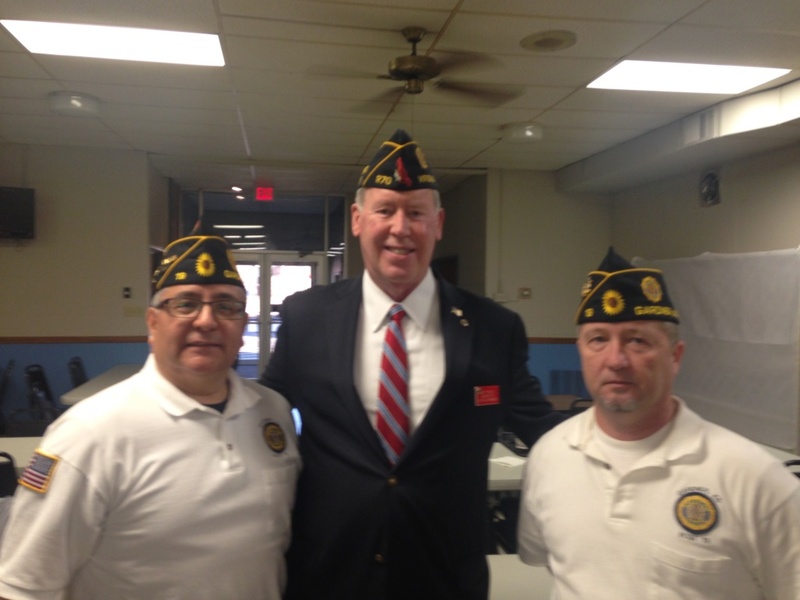 There are over 42,000 Veterans in Kansas over 60 years old. Wayne also mentioned the Lottery Commission offers a Veteran’s scratch off ticket and there is legislation to set a $2 million base for Veteran’s benefits. National Membership Director Billy Johnson from National Headquarters in Indianapolis, Indiana spoke on ways to recruit new members. There were many other reports presented Saturday which ended with entertainment Saturday night and closing reports and statements on Sunday.